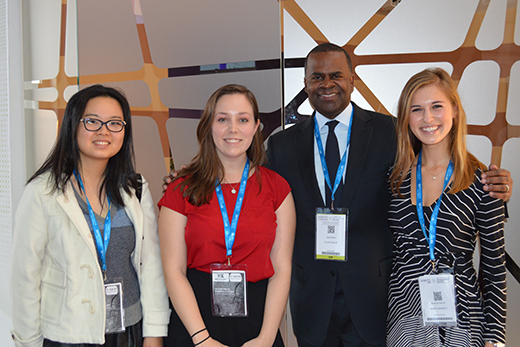 Emory students Siyue Zong, Mae Bowen and Savannah Miller appear with Atlanta Mayor Kasim Reed at the UN Climate Conference in Paris. Learn more about students' experiences through their blog about the trip. As delegates from more than 190 countries meet at the UN Climate Conference in Paris, Emory Provost and Executive Vice President for Academic Affairs Claire Sterk announced new university-wide support for Climate@Emory. This recently launched, campus-wide initiative advances scholarship, teaching, partnership and engagement around climate change at Emory and beyond. As a part of this initiative, Emory sent a delegation of faculty and students to participate in the Paris talks, which began Nov. 30 and continue through Dec. 11. “Our students and faculty already are making major contributions on this front,” says Daniel Rochberg, chief strategy officer for the initiative and an instructor in the Department of Environmental Health at Emory’s Rollins School of Public Health and in Emory College’s Department of Environmental Sciences. New support includes seed funding of approximately $125,000, which Rochberg describes as a "major boost" over previous funding for the initiative, which launched in spring of 2014. “Seed funding for Climate@Emory will enable the development of a portfolio of new activities and initiatives that promise to significantly advance our response to climate change in the years ahead," he explains. Climate@Emory leaders will meet Dec. 11 to kick off the process of developing new projects made possible by the increased funding, Rochberg says. "We’ve got a few initial project ideas in mind, and we’re hoping that we can start developing these early in the new year," he says. Emory students pose at the Paris climate talks — the 21st Session of the Conference of the Parties to the United Nations Framework Convention on Climate Change (COP21). Launched in Spring 2014 by several Emory faculty with support from the Center for Faculty Development and Excellence, Climate@Emory has quickly grown into a university-wide effort that draws on the expertise of more than 50 faculty and staff from over 20 departments. Leaders cite multiple accomplishments in the initiative's first academic year. Emory secured accreditation as an official observer to the UN climate negotiations. Faculty participated in a series of White House roundtables on climate change and health. The university convened a Day of Scholarship with experts from Emory and the Georgia Institute of Technology. Emory researchers published key findings on topics ranging from the physics of melting icebergs to the impact of climate change on China’s development trajectory. Nine Emory undergraduates and two faculty are currently in Paris for the 21st Session of the Conference of the Parties to the United Nations Framework Convention on Climate Change (COP21). The Paris trip is the capstone to a Coalition of the Liberal Arts (CoLA) course titled “Paris is an Explanation: Understanding Climate Change at the 2015 United Nations Meeting in France." CoLA courses are aimed at integrating the liberal arts experience across the humanities and sciences. The Paris course was developed and taught by three faculty: Wesley Longhofer, an expert in organization and management at Goizueta Business School; Eri Saikawa, an expert in climate science in the department of environmental sciences and Rollins School of Public Health; and Sheila Tefft, senior lecturer in the Emory Writing Program. Longhofer and Saikawa accompanied the students to Paris. As part of the trip, students are blogging about their experiences, ranging from meeting Atlanta Mayor Kasim Reed as he spoke at the Le Bourget La Galerie site on behalf of Atlanta's sustainability efforts to viewing protests and a variety of discussions. Watch their website for daily updates and follow the students’ comments on Twitter: @EmoryinParis.